I headed out to my new favourite location this afternoon and decided to try something different to my usual landscapes. The property sports an old, dilapidated cottage that's overgrown on all sides and provides several opportunities for interesting paintings as the sun moves from one side to the other. 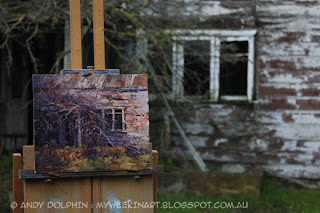 I decided that rather than paint a "pretty" picture of an ageing building nestled in its farmland surrounds, I'd get up close and personal and try to really capture the feeling of the house slowly losing its battle with nature. I'll post a finished photo and more information soon. Love it, can't wait to see more of it. I always love to explore an art galary when i found one. While surfing the net for some nice oil painting art collections i found your this post which really impressed me.